RARE Periodical: SWING, June 1940! From Jazz's heyday comes this RARE periodical, "Swing!" Published at the height of its popularity, this issue, June 1940 (vol. 2, no. 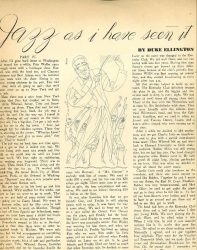 12), features articles on Mildred Bailey, Jan Savitt, Glenn Miller, and one authored by DUKE ELLINGTON! Note: Glenn Miller cover missing.